Jonathan Stidd recently launched an app that lets you post and search for missed connections. NEW YORK CITY — A growing dating app gives Craigslist's "missed connections" a serious facelift. Lost and Found riffs off the Craigslist dating page without the creepiness or the blue hyperlinked text, said founder Jonathan Stidd, 26. 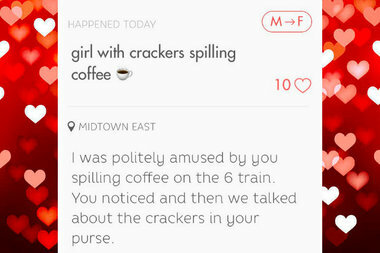 The app lets you post your missed connections and comment and like other people’s posts. Posts are anonymous. If you message someone saying “It’s me,” then your picture and profile become available to them. If they respond, you get to see their picture and profile. The app rolled out this winter where Stidd lives in Boerum Hill. Its community has grown organically ever since and now has about 2,000 users. This fall he’s going to start to advertise the app at NYU, working with a sorority there, Alpha Epsilon Phi, he said. Stidd is not the only one designing Missed Connection-style apps in New York City. Cheekd recently launched in Williamsburg with location data to encourage on-the-spot interactions. The idea for Lost and Found blossomed from Stidd’s own missed connection. “[It] started at Houston Hall with a girl in a flower dress. I haven’t found her but I did go on a date with the app,” he said. After the app launched in February, Stidd was running across the Brooklyn Bridge when he spotted a woman jogging. He thought they might click. Stidd posted on the app and a few days later she responded. He went on one date with her and though it didn’t turn into anything more serious, Stidd said he was still satisfied with the experience. “It sort of proves that it’s a slightly smaller world than people think,” he said. For those of you who don't sweat the small things, any tips for this easy going missed connection? #missedconnections #nyc #starbucks #isitpumpkinlatteseasonyet? QUIZ: Where Should You Go on a Date Off the L Train? QUIZ: How Much Do You Spend on Dating Each Year?